Using pentad rainfall data we demonstrate the benefits of using accumulated rainfall and fractional accumulated rainfall for the evaluation of the annual cycle of rainfall over various monsoon domains. Our approach circumvents issues related to using threshold-based analysis techniques for investigating the life-cycle of monsoon rainfall. In the Coupled Model Intercomparison Project-5 models we find systematic errors in the phase of the annual cycle of rainfall. The models are delayed in the onset of summer rainfall over India, the Gulf of Guinea, and the South American Monsoon, with early onset prevalent for the Sahel and the North American Monsoon. This, in combination with the rapid fractional accumulation rate, impacts the ability of the models to simulate the fractional accumulation observed during summer. The rapid fractional accumulation rate and the time at which the accumulation begins are metrics that indicate how well the models concentrate the monsoon rainfall over the peak rainfall season, and the extent to which there is a phase error in the annual cycle. The lack of consistency in the phase error across all domains suggests that a “global” approach to the study of monsoons may not be sufficient to rectify the regional differences. Rather, regional process studies are necessary for diagnosing the underlying causes of the regionally-specific systematic model biases over the different monsoon domains. Despite the afore-mentioned biases, most models simulate well the interannual variability in the date of monsoon onset, the exceptions being models with the most pronounced dry biases. Two methods for estimating monsoon duration are presented, one of which includes nonlinear aspects of the fractional accumulation. The summer fractional accumulation of rainfall provides an objective way to estimate the extent of the monsoon domain, even in models with substantial dry biases for which monsoon is not defined using threshold-based techniques. We thank the reviewers for bringing to our attention additional relevant literature, and for suggesting enhancements and clarifications that have improved the paper. We thank Charles Jones for input on the selection of the area-averaged SAM domain. K. R. Sperber was supported by the Office of Science (BER), U.S. Department of Energy through Lawrence Livermore National Laboratory contract DE-AC52-07NA27344. H. Annamalai was supported by the Office of Science (BER) U.S. Department of Energy, Grant DEFG02-07ER6445, and also by three institutional grants (JAMSTEC, NOAA and NASA) of the International Pacific Research Center. We acknowledge the World Climate Research Programme’s Working Group on Coupled Modelling, which is responsible for CMIP, and we thank the climate modeling groups (listed in Table 1 of this paper) for producing and making available their model output. 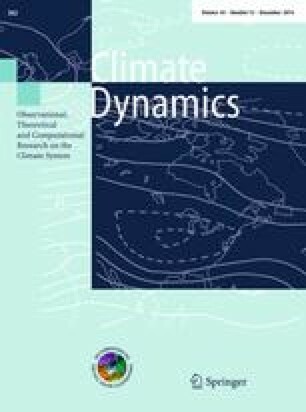 For CMIP the U.S. Department of Energy’s Program for Climate Model Diagnosis and Intercomparison provides coordinating support and led development of software infrastructure in partnership with the Global Organization for Earth System Science Portals.